Four National Parks, three cities, two classic roads and a wine region. Our coastal road trip visits some of the Northwest’s best destinations. Featuring unique landscapes only found in this part of the world, this is arguably the most scenic of all our trips. Amazing Coastline, Redwoods & Cities - Fab! Arrive in Seattle and check in to your first hotel. If you have any energy left after your flight, why not have dinner at one of Seattle’s great restaurants. Emerald City is one of the fastest growing cities in North America, famous for its coffee, grunge music and a growing tech sector. It has a laid-back charm with visitor highlights including Pike Place Market, the Space Needle and Pioneer Square. The words rugged, craggy and remote come to mind when thinking of Olympic National Park. Situated in the far Northwest of Washington State, this is one of the wildest places you'll be likely to visit. You won’t be alone though, Roosevelt Elk love it here amongst the trees, alpine meadows and waterfalls. Rialto Beach is a magical beach with huge pieces of driftwood, sea stacks and a black sand beach overlooking the Pacific. Tonight you'll stay on Lake Quinault, uniquely located within the Quinault Rain Forest which makes for numerous opportunities to take scenic short walks. Heading south today you'll cross the border into the “Cascades Mountain" region. The largest mountain in the range, Mount Rainer, hasn’t been active for many years but is still the most prominent attraction and is a protected National Park. Filled with meadows, craters, glaciers and an abundance of wildlife, flora and fauna. This is one of the real scenic highlights. After 3 days in the great outdoors, it's time to visit Oregon’s biggest city, Portland. Your Itinerary Pack will help you plan out a couple of days worth of sight-seeing. A distinctively trendy city, Portland has a range of activities to suit all interests. If you're an early riser, we recommend a visit to Multnomah Falls in the Columbia River Gorge. Another day to enjoy the pleasures of Portland. A must see for the team at The American Road Trip Company is the Japanese Gardens in Washington Park. Oregon Zoo is a great visit also. Once you’ve ticked off all of Portland’s must-see places and enjoyed the tax-free shopping you’ll head west to the Oregon Coastline along Sunset Highway. You’ll soon hit the coast near Cannon Beach and the equally stunning Ecola State Park. Today you'll drive the stunning Route 101. Whilst California's Highway 1 gets a lot of attention for its scenery, we think this Highway has it all and more. Complete with quiet seaside coves, bustling beach towns, and secluded hideaways, today's drive makes for a scenically memorable one unlike any other. Today you'll leave the coast and head up to the stunning Crater Lake. No place else on earth combines a deep, pure lake, so blue in colour; sheer surrounding cliffs, almost two thousand feet high; two picturesque islands; and a violent volcanic past. It is a place of immeasurable beauty, and an outstanding outdoor laboratory and classroom. It’s yet another scenic drive today - down to Redwood National Park in northern California. Redwood trees were once common throughout North America. Sadly now they are mostly found in just Oregon and California. The ultimate Sequoia experience is here in Redwood National Park. These are true giants at up to 100m high and 11m in diameter. Arrive into the richly agricultural Sonoma and Napa today. Both neighbouring valleys offer stunning scenery made up of perfectly manicured vineyards stretching across rolling hills. A foodies’ heaven, with an emphasis on 'farm to table' dining, you'll be spoiled for choice on where to eat. Continue south and cross Sausalito Bay into the city of San Francisco. After returning your hire car and checking into your hotel you may want to ride a cable car or stretch your legs by exploring on foot. Full of Victorian charm combined with a cosmopolitan vibe, San Francisco is a wonderful all-rounder with world-class attractions unique to this city on the bay. 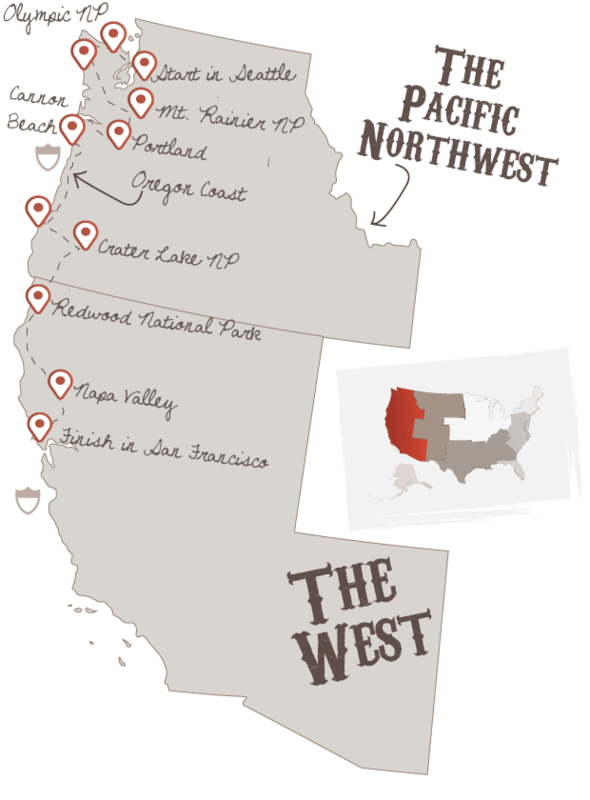 Don't forget to check out this road trip's Itinerary tab to see more amazing pictures from our 'Northwest Explorer' tour. You'll also be able to read a little bit about what you'll be getting up to on each day of this incredible road trip adventure.